The month has just sped past for me - helped by having a LOT of Stoicism-related matters (STOICON, Stoic Week, a number of talks, and a good bit of work over at Stoicism Today) to focus upon! It is the very day - and almost the hour - for our monthly Public Q&A session. This is something I engage in each month, totally free for anybody who wants to come (I also hold another one each month exclusively for my Patreon supporters). 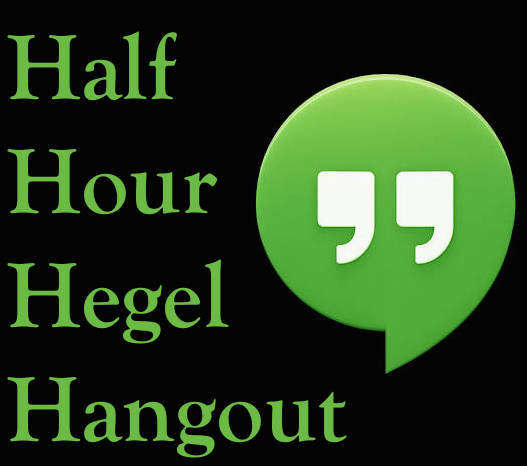 If you'd like to talk, listen, or ask questions about anything Hegel-related, today is the day - 5-6 PM Central (i.e. Chicago) Time, I'll be holding the session via Google Hangouts. I'll post the link for the Hangout once it's opened in several locations - my Patreon page, my Facebook author page, in Google+, and in Twitter. So, if you want in, you'll want to check at least one of those around the time the Hangout started.